Would the Zetas care to comment on the meeting between Merkel and Trump? Take a look at the Chancellor's face!!! And so much like her father! Would the Zetas care to comment on the meeting between Merkel and Trump? Take a look at the Chancellor's face!!! And so much like her father! White House meeting with Trump was catastrophic for Merkel. The photographers called for the two to shake hands and Merkel can be heard saying: “Do you want to have a handshake?” Trump ignored her. She had two main aims for her meeting with Trump: to secure support for a more powerful European Union, and to calm Trump-inspired pressures on the NATO alliance. She failed catastrophically on both fronts. Trump has been consistent. He believes the US is being ripped off by its NATO colleagues. Any attempt to imply they will increase their contributions to the required two percent of GDP by 2024 falls on Donald’s deaf ears. He wants the money now. Germany has rejected President Donald Trump's claim that the country owes NATO large sums for underspending on defense. Berlin's defense budget has long been below NATO's target of 2 percent of a member's gross domestic product. The world's financial leaders are unlikely to endorse free trade and reject protectionism in their communique on Saturday because they have been unable to find a wording that would suit a more protectionist United States, G20 officials said. G20 finance ministers meeting in the German resort town of Baden-Baden noted the importance of trade to the global economy, but dropped tougher language from last year that vowed to “resist all forms of protectionism”. Germans Unhappy As ‘Climate Change’ Is Dropped From G-20 Communique. March 19, 2017. This is very good news for everyone but the Germans who are hosting the summit in Baden-Baden. It would never have happened in a world where Donald Trump wasn’t President. And it’s a clear signal of who is controlling the New World Order. No longer Mrs Merkel, it would seem. planned to use her Muslim immigrants in concert with Erodogan to take control of Europe. Trump knows this and gave her no quarter, taking the opportunity to use the forbidden phrase “radical Islamic terrorism” in her presence. He is in charge, she is not. President Trump stated clearly during his campaign that he considered the NATO alliance to be an anachronism from World War II. It obviously defends Europe, not America. But the generals in Trump’s administration find value in NATO so the message has morphed to be paying the fair share of the cost. Europe has obviously never done this, while America has paid almost double their fair share. Where this is unlikely to be quickly resolved, it does give Trump an excuse for pulling back from NATO exercises. Meanwhile, the elite in Europe, who have for centuries ruled via royalty, are made nervous. President Trump has made it clear that he intends to tax those who take US manufacturing elsewhere and expect to sell to the American public afterwards. Thus the Globalist agenda has been dealt a death blow. Globalism was not invented to serve the poor. It was invented to financially benefit the wealthy but primarily to allow the elite to control the American public who were being brought to their knees. These elite wanted to control the US military, as large as all others combined, but intended to manage this by vote fraud to put Hillary in charge. Trump and his Junta have made it clear that the American citizen won in this battle, and the elite lost. President Trump has made it clear he does not intend to perpetuate the cover-up over Nibiru. Since Climate Change, the new term for Global Warming, is real, what will be his response? Presumably, pointing to Nibiru at some point will be his response. There will be no funds, nor any anti-pollution measures supported by the Trump administration, that support fraudulent Global Warming claims. Coal country rejoices, while the elite who still hope to deny Nibiru and stood behind the many lies and fraudulent data on CO2 emissions and temperature rise scramble to avoid public anger. Once again the elite lost. Merkel has been an aggressive proponent of bringing in Syrian refugees, who seem to be disproportionately young men rather than complete families with women and young children and the aged. This begs the question, why did these young men desert their families? The suggestion made by this German engineer, in his deathbed confession, is that this refugee welcome is deliberate, to sculpt the population into a worker force rather than a citizen base demanding social services. The refugee influx into Europe has proved to be a disaster, with an aggressive counter push to keep refugees in their homeland, to be resettled there. Was this Merkel’s plan, and has it failed? Yes. A water main burst with such force it damaged windows and cars and left homes needing to be evacuated. The burst in the Chester Green area of Derby sent a plume of water three storeys high. Sounded like a bomb going off at about 02:00 GMT. Clearly the explosive boom, shattering glass and housing and cars nearby, was more than water pressure. A breaking main will cause flooding and eat away the pavement nearby, but is not an explosion. Is water pressure to maintain flow to nearby housing that strong that an explosion would occur? Derby is in the stretch zone affecting the Manchester region, which recently had EMP bus and van fires as a result. One can see the effect of plate movement and stress by tracking these water main breaks. For the US, it is in the arc of the bow along the East Coast and at the center of the bow in California. I've just read a report from the New York Times that David Rockefeller is dead. If this is true can the Zetas comment on whether or not his death was natural or an assassination. after all he was 101 years old. And what impact will this have on the announcement? It's relief changes or heating of core? Too much attention from the media .... from Pope Francis to Washington Post. The worst flooding in 20 years is scouring the arid landscape of coastal Peru. Exceptionally warm water in the Pacific Ocean is fueling torrential rain in western South America, which then comes pouring down out of the mountains. The extraordinary amount of water has overwhelmed surrounding towns. It looks a whole lot like El Niño in Peru, but you won’t be hearing that description from climate forecasters anytime soon. Flooding is expected to continue for another two weeks, and the death toll is a moving target. However, 72 people have died so far as of Saturday, according to the Associated Press. In the capital city of Lima — an arid region that rarely sees rain let alone deadly flooding — authorities pulled people from the muddy water. It looks like it's increasing. Where it leads? Media blame El Niño, but what caused it? Accepted because many are asking various questions, not because he was assassinated. If this is true can the Zetas comment on whether or not his death was natural or an assassination. After all he was 101 years old. And what impact will this have on the announcement? It seems the elites are losing, this just in that David Rockefeller is dead at age 101 after having so many heart transplants. The puzzling part is why did they not hide his death like Soros? Died at the age of 101. Had an estimated fortune of $3 billion, retired as head of Chase Manhattan in 1981 after a 35-year career. One popular online theory surrounding Rockefeller is that he broke the world record for most heart transplants with up to seven, the last one allegedly as recent as last year. However, there’s no record of any patient ever receiving that number of heart transplants. At the head of this octopus are the Rockefeller Standard Oil interests and a small group of powerful banking houses generally referred to as international bankers. The Federal Reserve is a private corporation. It is neither Federal, nor does it have any Reserves. The Federal Reserve creates money out of nothing, then collects interest on the debt. It was conceived by several of the world’s wealthiest bankers in 9 days of secretive meetings at a Jekyll Island retreat in November of 1910. Per the Zetas, the banking system has been opposed to the announcement admitting Nibiru, by Obama, and has been caught in the war with the Council of Worlds, thus. As the battle of the cover-up rages on, it is impossible for Israel, Netanyahu, control of the Federal Reserve, and control of the oil in the Middle East to be separated. They all want the cover-up to continue. Indeed, as Fulford reported, the website federalreserve.org was down, though the domain registration was effective until 2016. This represented the private management of the Federal Reserve. The US government management of the Federal Reserve, on federalreserve.gov was firmly in place. David Rockefeller died a natural death at 101 years of age, nor will his death cause any ripples around the world. Does his death matter? The Rockefeller family formerly controlled part of the Federal Reserve, being on the Board of Governors. But Dunford took that control away from the board in 2016, retaining only US government control over the Fed, so Rockefeller’s death in that regard was irrelevant. His personal wealth pales when compared to Soros – 3 billion vs 26 billion – and Soros was attempting to destabilize the US and Europe, for his gain. Thus the Soros network continued after his death, with a double, where Rockefeller was allowed to die in peace. It's relief changes or heating of core? Too much attention from the media - from Pope Francis to Washington Post. It looks like it's increasing. Where it leads? Media blame El Niño, but what caused it? SST bouy data animation from January 2017 to 14 March, 2017 shows that the some heat seems to go from the bottom up over at 400-450 m at 100-90 w.
The unnamed phenomenon behind Peru’s extraordinary flooding. The worst flooding in 20 years is scouring the arid landscape of coastal Peru. Exceptionally warm water in the Pacific Ocean is fueling torrential rain in western South America, which then comes pouring down out of the mountains. The extraordinary amount of water has overwhelmed surrounding towns. It looks a whole lot like El Niño in Peru, but you won’t be hearing that description from climate forecasters anytime soon. The warm ocean water behind this month’s flooding suggests another El Niño may be forming. 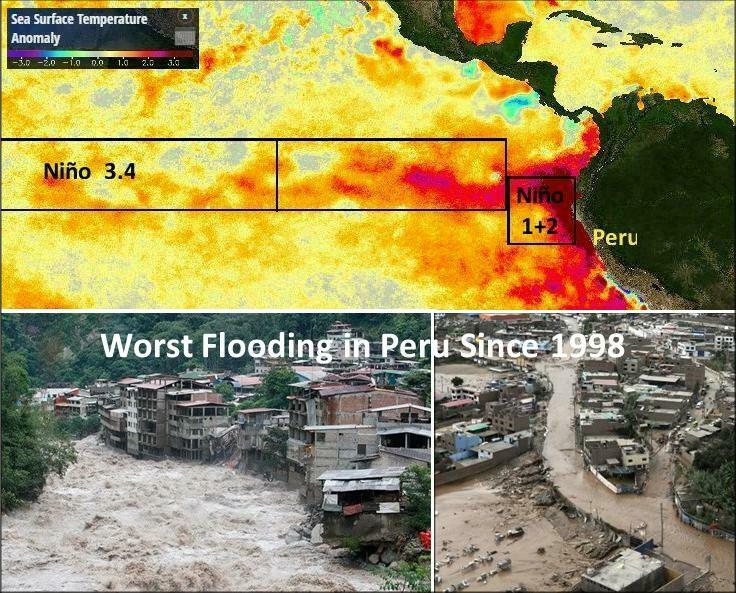 The water is so warm, actually, that Peru climatologists declared a “coastal El Niño” to communicate to the public the kind of conditions they should expect and prepare for. The situation doesn’t meet NOAA’s technical definition of an El Niño, so you won’t be seeing the agency declare its arrival. But the warm water is blatantly obvious off the coast of South America in 2017. It’s kind of like half an El Niño, but for all intents and purposes in Peru, it might as well be a whole one. Of course this is not an ordinary El Nino, which has its origins from the submarine volcanoes in Indonesia. This warm water off Peru seems to spring to life over the Nazca Plate. The establishment is temporarily surprised and taken off guard as they have no term to explain this, except to admit that the ZetaTalk 7 of 10 plate movements are indeed happening and the S American Roll is pushing the Nazca Plate under the spine of the Andes, thus the heat. The establishment will increasingly be left stumbling for an explanation until Nibiru is admitted. The following article states high waves in Durban South Africa. It was remarked that it was caused by cyclone Enawo from Madagascar. As the Zetas have stated that sloshing will occur as the wobble intensifies and becomes more frequent. Is this the case with Durban? Will we see more of this world wide, as in all coastal areas? The large surf is “part of the cyclone swell” brought on by powerful Cyclone Enawo which hit Madagascar five days ago [March 7], the strongest storm to hit the island in 13 years. March 19, 2017. A tsunami hit the port city of Dayyer in Bushehr Province, southern Iran, killing one and leaving five missing. The high waves that hit the coastline surprised New Year tourists, killing a 51-year-old man. An eight-year-old boy from Dayyer, as well as four Iranian tourists in their a car, also disappeared after they were hit by waves. How could a storm at Madagascar on March 7 cause high tides in S Africa five days later on March 12? This is an establishment excuse that does not hold. These swells and those that struck the Iran coast on March 19 arose from the African Roll, which forces the waters in the Indian Ocean to rise and thus these waters must equalize. Thus waves slamming into southern Iran. Thus waves flowing from the Indian Ocean to the Atlantic. For those familiar with the ZetaTalk predicted 7 of 10 plate movements there is no mystery. But the establishment chooses to treat all these incidents as separate and unrelated, along with evidence of the African Roll from the Mediterranean. When Nibiru becomes obvious, the public will connect the dots. Could the Zetas speak to the rather substantial decrease in the number of earthquakes being reported by CERI? As of today the total number of quakes for the last 6 mons, is down to UNDER 950. I've been monitoring this site for MANY years, and it's been a goodly number of years that "Total" reported has fallen this far down past 1000 [this past month, after steadily falling for the last several months]; when the total has regularly held between 1600 to 1700, and more often up between 1800 and 1900 [piquing over 2000 from time to time] since I've been monitoring on a daily basis. Where many might see this as a good thing--less seismic activity around the NMFZ and Oklahoma, etc., I question what is going on. Is this a calm before the storm? Or are certain quakes not being reported; publically? Or... ? But even with that, data shows growth. Thank You, Stanislav! Right now, the CERI data is showing a SHARP DECLINE. That should make anyone watching seismic data wonder WHY? Thank you both for your research and elaborate report! This all shows the hand of USGS in dumbing down the quake magnitude and frequency. Though this is not new, and has been addressed before by the Zetas, all your dual efforts should be rewarded! Right now, the CERI data is showing a SHARP DECLINE. That should make anyone watching seismic data wonder WHY? Could the Zetas speak to the rather substantial decrease in the number of earthquakes being reported by CERI? As of today the total number of quakes for the last 6 mons, is down to UNDER 950. I've been monitoring this site for MANY years, and it's been a goodly number of years that "Total" reported has fallen this far down past 1000 [this past month, after steadily falling for the last several months]; when the total has regularly held between 1600 to 1700, and more often up between 1800 and 1900 [piquing over 2000 from time to time] since I've been monitoring on a daily basis. Where many might see this as a good thing--less seismic activity around the NMFZ and Oklahoma, etc., I question what is going on. Is this a calm before the storm? Or are certain quakes not being reported; publically? But even with dumbing down the reporting, data shows growth. The goal of the USGS and those forced into compliance is to give the appearance of NO increase in earthquake frequency or magnitude. This at a minimum requires the USGS to purge as many earthquakes as possible. They do this by deleting aftershocks and eliminating those quakes that occur out in the ocean or in remote areas. Then reducing the magnitude is done. This was gradually done but at the present time, as we have stated, it is a reduction by approximately two full magnitude points. If the USGS says it is a magnitude 5, you can assume a magnitude 7. Of course they look ahead, anticipating quake swarms and larger quakes. Even with alterations, the truth could get out suddenly during quake swarms or a strong uptick in magnitude. So they prepare the bed, reducing what is reported, reducing the magnitude reported, so that such an anticipated uptick does not take them by surprise in the middle of the night. When the quake reports seem to show a reduction, this is the reason. The quakes have not stopped, nor gone down in ferocity. The reporting has just been softened in anticipation of more increases. Greater than 90% of the earthquake activity is being altered by the USGS at present, which is under orders to prevent any clue being given to the public about the Earth changes caused by the presence of Planet X. It will not be a lack of information from the USGS that will be the point of confusion during the earthquakes leading up to the New Madrid adjustment, it will be knowing which quake is the big one vs the many minor quakes preceding it. The USGS downgrades almost all earthquakes, to prevent meaningful statistics from being generated from their databases.